Its hard to believe but the rehab horses who arrived in March will have been here 8 weeks by next weekend - time for some updates, as I am really pleased with the progress they have all made so far. These are Billy's feet - his original photos above and todays' photos below. He arrived in bar shoes and pads and with an exaggerated heel first landing in his bar shoes which reverted to a toe first landing out of shoes. Not surprisingly his palmar hoof was extremely weak and his diagnosis on MRI was DDFT and navicular bone damage. Its great to see the solid improvement in his frogs, heels and digital cushion and this is confirmed by his much more confident landing - the footage is linked below. There is a lot more structure to the back of his foot now and he has reached the point where he can move correctly on hard surfaces as well as conformable surfaces which is a huge breakthrough. You can, I hope, see from the change in his stance that he is more comfortable; the essential is that this is translated into better movement, which is the critical thing. As you can see, better movement builds better frogs and that in turn builds a better, stronger hoof internally, reducing stress and damage to the DDFT and navicular bone. As Billy continues to move with a heel first landing and gets proper stimulus from the surfaces he is moving on his feet should continue to recover. These photos are a good illustration of why bar shoes and pads give only a temporary solution. They did indeed give Billy a better landing than he had out of shoes but the structures of his feet, both internal and external, were atrophying as a result of the lack of correct stimulus. Out of shoes and with supportive but stimulating ground to move on he ca start to build a stronger, healthier foot. We had to have a couple of attempts at filming today as someone kept video-bombing...Footage is below, showing progress over the last 7 weeks. Billy has been working the arena since his second week and we have added roadwork as well as over the last week, which has helped improve his landing further. I had a great weekend on Long Island running a workshop organised by the amazing Jeannean and while I was there I promised I would put up a blog post with more information about the tracks we have here. Tracks are great because they encourage movement and allow horses to hang out together, which lets face it is what they enjoy doing. 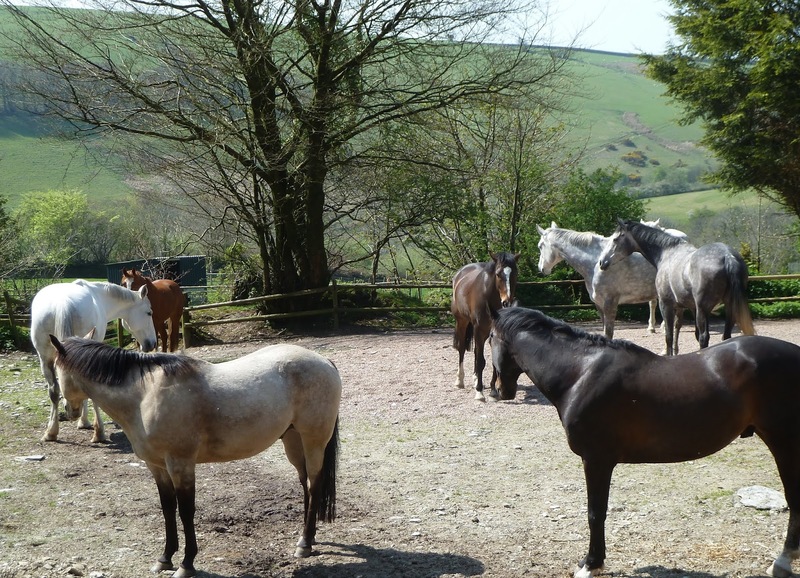 The horses frequently all choose to occupy the same area of the track - here are 8 of them in a group and the lower photo is another good example - because its more natural to them than being evenly spread put over a bigger area. 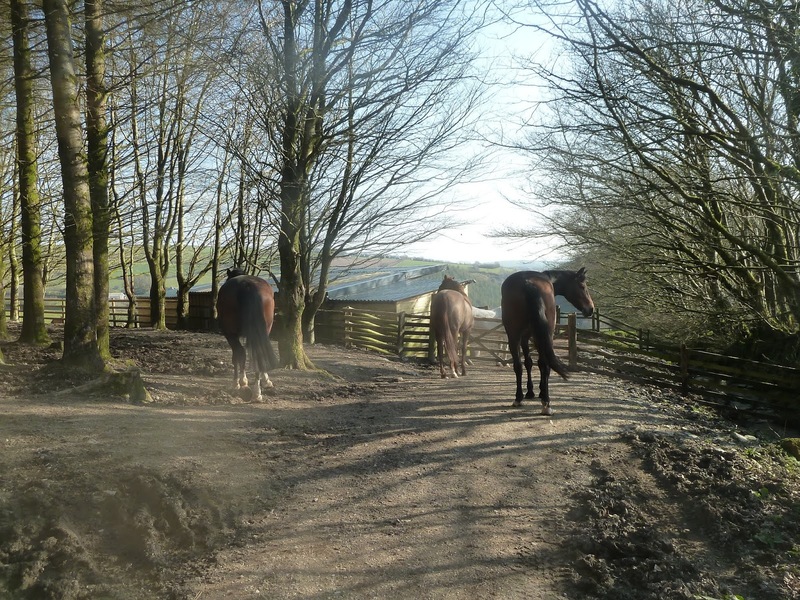 The main track is not terribly big - it links 3 different yards and an area of woodland together so that the horses have a variety of things to look at and can get out of the prevailing wind or rain if they want to. We can also feed forage in lots of different places and they have to move to see what is going on around the corner. 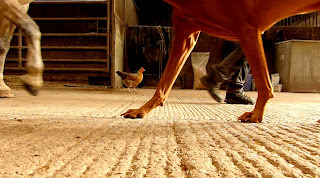 The surface on the main track is a mixture of shingle, stone and earth - there is more details in the first post linked above - and the most important thing for the rehab horses is that it is conformable, so provides support and stimulus for weak hooves. If you are thinking of laying a track yourself, getting drainage right is an essential first step and its easier and cheaper to use existing areas and link them rather than try to create something from scratch. Sisco gets the last update, only fair as he arrived a few days after the other rehab horses so only got to 4 weeks on Tuesday! I like the fact that his hairline no longer collapses at the back but this foot still has a lot of work to do to rebuild. His toe is shortening though and he is, importantly, much sounder than he was even though his landing on a hard surface is still toe first. On conformable surfaces he is heel first so that's what he needs at the moment. Hard to see much change from this angle but in reality he is engaging his palmar hoof more readily. Although his toe is still long and his heel under-run at ground level notice what a change there is right at the top. As this grows down it should result in a stronger heel, frog and digital cushion. From the sole you can see that his toe is slowly shortening though this will take time. You could mechanically shorten his toe with a trim, which would improve appearances, but at the moment this would impair his soundness so we won't be doing that. Moving onto Poppy for today's update, she was the soundest of the rehab horses when she arrived. She'd been out of shoes for several months and had a heel first landing which was a recent change for her from toe first. She did have quite contracted frogs despite this and its good to see the back of her foot starting to become less pinched (the lower photo is the more recent. as usual). This foot is looking better balanced now and also has a stronger digital cushion though she still has a way to go - her frog is still relatively weak and I would expect her palmar hoof to develop a lot more over the next few weeks and months. No dramatic changes from this angle; her feet were already fairly neat when she arrived. I like the fact that her frog is straighter and more central to her leg now but there is still an imbalance on this foot and its still weak as the ridge of sole demonstrates. Looking better from a palmar view but still stronger feet are required and will take time to grow. Continuing with the updates its time for Humphrey to feature on today's blog. Over the 4 weeks he has been here he has gone from landing toe first to a better, heel first landing (his footage is below) and although he still needs to build his palmar hoof up further you can see the changes in his photos as well. Dry feet always photograph better than wet feet unfortunately but he has a broader frog today (below) and his toe is shorter as well. A clearly better digital cushion and this should improve again now he is consistently landing better. He is also happier to load this foot now than he was on arrival and again a better landing has allowed the palmar hoof to build. Again, a better frog and more balanced foot, both good signs.